I’ve mentioned before on this blog how much I enjoy post-apocalyptic fiction. There is an abundance of zombie fiction on the go these days, and it’s one of the sub-genres of horror where people aren’t afraid to experiment and play with the tropes, which keeps it somewhat fresher than you might expect. So we find ourselves dealing with the rotting recent-dead of Romero’s Dead movies, as well as the virus-infected zombies of the 28 <Arbitrary Time Period> Later films, and those affected by unidentified radio waves, as in Stephen King’s Cell. To my mind, though, there has always been a bit of a gap in the post-apocalypse sub-genre, particularly when zombies are involved, and it always occurs to me in the form of a question when I’m reading such a book: the author focuses on a set of survivors who have lived through whatever disaster forms the setup for the story, and how they cope in the post-apocalyptic world, but what about those people physically removed from civilisation at that point in time? I’m usually thinking along the lines of the handful of men and women who are currently sitting on the International Space Station, but you get the idea. Adam Baker’s first novel, Outpost, finally fills this gap. As the novel opens we find ourselves in the Arctic oil fields, bedded down on Kasker Rampart, an oil refinery manned by a skeleton crew of fifteen, awaiting their imminent return to society before the refinery is shut down, or relocated. Weeks before the ship is due to arrive to evacuate them back to Britain, they begin to see worrying news reports on the 24-hour news stations – people are turning violent, killing those around them; a trend that seems to be spreading around the globe. As, one by one, the channels begin to go off-air, leaving the crew with the uneasy suspicion that there might be no home to return to, they begin to make plans, driven by the fast approaching winter (and the months of endless night that come with it) and a rapidly dwindling store of supplies. The bulk of the story is told from the point of view of Jane Blanc, a priest assigned to run Rampart’s chapel, a thankless job that sees her mainly ostracised from the rest of the crew and on the verge of suicide before things start to go wrong in the outside world. Jane’s development from these humble beginnings to the leader of the ragged crew is well-documented and very believable. We follow her as factions form within the crew, and alliances are made, broken, remade. For the first half, this is a zombie novel at one remove: there are no zombies here, but they are out there somewhere, of no danger to our characters. It’s a story of survival against all odds and the characters – and their development over the course of an unknown time period – are brilliantly realised. Halfway through, the game changes, and infection intervenes, bringing with it a whole host of new challenges for the crew of Rampart. Yes, this is a virus-induced zombification, and it is never made clear how the infection started or where, exactly, it came from. Sure, there are hints, but it’s secondary to the main story here, and the direction Baker takes us means that we never need – nor want – to find out, because we’re too busy following what’s going on. Suffice it to say that the latter half of the novel is closer to the traditional zombie formula, but by no means a rehash of anything that has gone before. The novel is told in clipped, matter-of-fact tones and short, snappy sentences of the type you’d expect to find in hard-boiled detective fiction. Along with numerous jump-cuts, this serves the plot well: it builds tension, and it helps to remove a sense of time – we have no idea if what’s happening is happening over the course of hours, days, weeks or months. We can guess at various points, but it’s next to impossible to pin anything down for sure. Baker has no such qualms with sense of place: you’re fully aware for the duration of exactly where you are. This is the desolate wastes of the Arctic and it’s cold! That’s not a fact you’ll forget easily as you read. 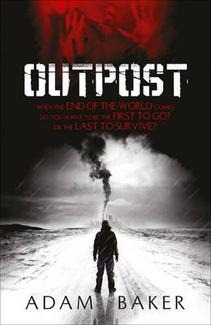 In all, Outpost is an assured debut, and a welcome addition to a fine sub-genre of horror. Fast-paced, dark and unpredictable – Baker’s not afraid to put his characters through the mill, or kill them off for that matter – it’s exactly what I expect from a good horror novel. There is plenty of stiff competition in this area of fiction – Stephen King’s The Stand and Robert McCammon’s Swan Song being two of the best – but Outpost is a worthy comer that will have no trouble standing up with such fine company.